UConn wanted to make a statement in Big 12 country that it has national championship pedigree. 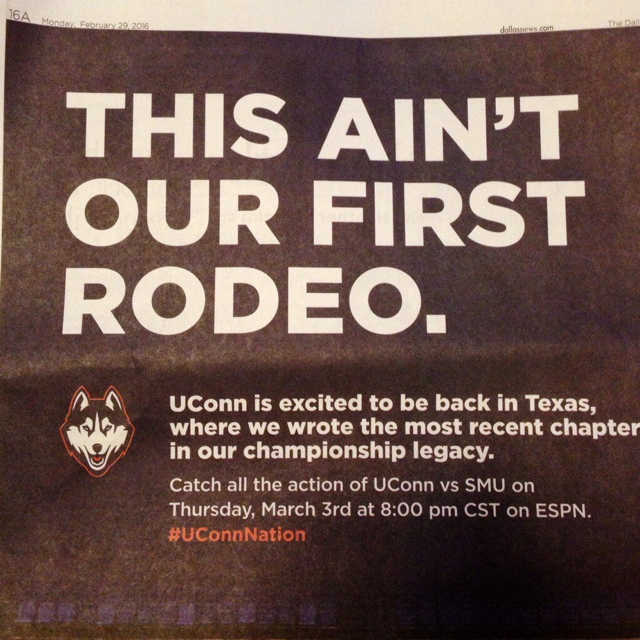 So, university communications took out a full-sized ad in Monday's Dallas Morning News trumpeting the men's basketball team's success -- and, in the midst, taunting Thursday night's opponent, SMU. It's funny and cute, but is it really necessary? UConn very much needs a win on Thursday night. SMU will already be brimming with emotion. It's Senior Night, and the seniors (particularly Nic Moore and Markus Kennedy) have been through a lot. They learned in September that they were barred from the postseason in their senior seasons, so it's already been an emotional year for them. Add on the fact that it's their final home game at Moody Coliseum, along with the fact that the Mustangs are still very much in the hunt for their only tangible goal -- an AAC regular-season title -- and, like we said, emotions will already be running high. An ad like this (and again, it should be pointed out that it was university communications that took out the ad, not athletic communciations) could serve as bulletin-board fodder and only add to that emotion. Maybe I'm overthinking it, but knowing today's athlete, any extra motivation can likely only help SMU. (Oh, and by the way, the game's on ESPN2, not ESPN). Ability is what you're capable of doing. Motivation determines what you do. Attitude determines how well you do it. See the link below for more info.